RMG sector is one of the important sector which has so many contributions in social, technological & environmental development of Bangladesh. In this article, some major social, technological & environmental contributions of RMG sector is described. It will be helpful to know the condition, impact, ways of development, future scopes of RMG sector in our country for various development. Once upon a time woman were likely to spend inhouse activities like child upbringing, cooking, taking care of relatives etc. No-a-days from educated to uneducated women, this thinking has been changes a lot. This contribution mostly goes to RMG sector. According to a survey of Center for Policy Dialogue(CPD), released on Mar’18, among garment worker 60.8% are female & 39.20% are male. The survey was conducted on 2270workeers in 193 factories in Dhaka, Gazipur, Narayanganj & Chottogram. These large portions of women are mostly less or uneducated. Rather than this, they are likely to contribute family income. Women earn to make better their livelihood, pay children educational expenses, make savings and overall, they are not anymore, a burden for their family. In apparel sector there is a lot of work scope for women. They work in quality section, sewing section & finishing section mostly. RMG sector provides adequate safety, payments, rest breaks, medical facility, insurance facility, motherhood vacation, children scholarship programs etc. for women workers. According to a report published in The Daily Star in Jul’18, 2018, many female workers leading trade unions in various factories. Some female worker is divorced of single parent & still managing their families very well. In many cases it has seen that their children upbringing is so well that they become highly educated. Some women then pursuing their career in their own tailor shop, they become entrepreneur! Not only less educated or uneducated women, but educated women are also most likely to work in this sector. There are so many Industrial Engineer & Textile Engineer in recent & there is a significant number of women in them. They are giving their best for the development of the RMG sector. They are working in Industrial engineering department, Planning department, research & development department, merchandising department, technical department, human resource department, Training & co-ordination sections etc. In some case they are best choices for employer as they have good analytical abilities, manpower handling capabilities, dealing capabilities, representation capabilities etc. Some of them are work in production sector equally with man & flourishes this sector with their knowledge & capabilities. Working women are blessing both for their family & organization. Many of them are indirectly involved in RMG sector with their research work, social work and so on. In some cases, female worker is most preferred for their cool-headed decision rather than male. For example, in garments quality section it needs smooth observation, in sewing it needs immense accuracy or in costing or merchandising it needs precision or dealing capabilities. These types of qualification are born nature of women hence they are major choice for these section now-a-days. There is considerable presence of foreign professionals in different section including merchandising (20.30%), Production planning (37.30%), sewing, knitting, washing, quality, industrial engineering, research & innovation, supply chain. Along with continuous development of RMG sector hopefully very soon these places will be taken by local expertise & there will be remarkable number of women also. Women empowerment in RMG become an example for foreign country like India, China, Myanmar, Vietnam, Ethiopia, Jordan etc. These country apparel experts are interested to hire women worker as well as professionals. Women from RMG sector sometimes leads a community or group to achieve their demands. They are twinkling example of how to start from zero & how to be valuable star in their own life. Women struggles beside man to earn livelihood & supporting husbands also. Educated women entering garments sector in different fields & they are not likely interested in bank job or teaching professions as previous. They started thinking out of box. For example, Swapna Bhowmik, country manager of M&S, was the first Bangladeshi to become country manager of the British retailer. Women are equally a great part of management system in garments industry. The Harkin Bill placed at the US Senate entitled “The Child Labor Deterrence Act of 1993” which called for the elimination of child labor in the export-oriented manufacturing and mining industries. After that in our country so many garment industries stop hiring child labor & arrange a better life for them some of the organizations provide monetary help, some set up training schools, some got help from the government. International Labor Organization, BGMEA, UNICEF started so many projects to stop child labor. According to the Bangladesh Bureau of Statistics report, in 2003 there were 42.40 million children of age group 5-17 was working directly or indirectly involved in this sector. Out of those 35.10 million were age group of 5-14 & 7.30 million were 15-17 age group. Out of the total estimated child population aged 5-17 years, about 22.70 million were boys & 19.70 million girls. There were so many reasons like poverty, a family force for income, avoiding early marriage, not interested in study etc. In 1995, a project was initiated by BGMEA along with ILO and UNICEF based on a Memorandum of Understanding (MOU). The key elements were a fact-finding survey to determine the extent of child labor in the garment industry, education programme establishment, monitoring, and verification system establishment, stipend income compensation (300 Taka at that time). BGMEA spent mostly 600,000 $ for the project. There was positive impact on child labor & gradually its number decreased. Now there are so many national & international organizations who are working in this sector to eliminate child labor. Apparel sector is now aware of this section & strictly avoid child labor force. So many social & audit organizations are working for the proper implementation of labor laws in Bangladesh. Population problem is the major problem for a developing country like Bangladesh. Employment opportunities for women is creating positive impact on the family planning and population control of a country. Working women are interested to family planning & keeping small family. They feel the necessity of proper upbringing for their children hence they plan for one or two children. Early age marriage also reduces because of women empowerment. Average age at marriage for girls working in RMG factories tend to be higher than the national average. In this regard government takes so many family planning programs, builds hospitals & clinics, free supply of family planning facilities & products and some of private organizations also working several projects. BGMEA Healthcare Activities for Workers: Establishing healthcare & medical facilities. Most prominent was 150-bed modern hospital at Mirpur, Dhaka, which is equipped with burn and emergency units. Approximately 10.96 core spent for the project. BGMEA-UNFPA-GOB Project: In 1998 & 2003-2005 there were two mixed projects of United Nations Population Fund (UNFPA) & BGMEA, for family welfare & reproductive health education among garments worker. In last project BGMEA provided 430000$ & UNFPA provided 290000$ for this project to be successful. Workers’ Health Check-up Project: BGMEA & BRAC provide health check-up facility based on charged premium health care facility. Up to 9000 workers were provided this facility. Non-formal educational programme: Under this component of the Child Labor Elimination Project, 8200 students were enrolled in 336 schools, run by two local NGOs, Bangladesh Rural Advancement Committee (BRAC) and Gono Shahajya Sangstha (GSS). There are so many programs currently running, in Dhaka there is 92 schools. Earn and Learn Programme: There are so many programs under this banner. BGMEA, BKMEA, BRAC, WORLD BANK, Bangladesh Finance ministry runs so many programmes. Skills for Employment Investment Program(SEIP) is one most popular training program for youth that can is very helpful to create skillful employee. Organizational & self-safety program: There is mutual program of Bangladesh Fire Service and Civil Defense Department along with BGMEA & BKMEA to train garment sector employee & worker to train about fire &firefighting equipment, awareness building on fire prevention, first aid, proper electric wiring and evacuation facilities. Village garment project: Along with the project of Government of people’s republic of Bangladesh to convert village in city, BGMEA wants to set up garments & apparel infrastructure in those area. With the improvements & developments of modern technology, our RMG sector also developing. People are focusing on adopt new technologies, machines, methods, materials etc. From yarn making to logistics services people are using modern methods & technologies to make it quicker, accurate & user friendly as well as quality full. Now we can produce various types & parameters of fabric, digital & rotary printing, weaving more complex fabrics, producing in house trims & accessories, finish fabrics as per buyer requirements, sewing fancy items, wrinkle free items etc. In modern industrial revolution of methods & technology we are planning for every minute capacity, doing forecasting, inventory controlling, material requirement planning, managing supply chain flow, follow total productive maintenance (TPM), total quality management (TQM), brainstorming session, automation, standardization, innovation etc. This trend is running in other manufacturing sections also. Fashion trend also change with continuous improvement of this sector. People are more likely to wear fusion dresses. Women want dresses, saris, salwar kameez, tops with a mix trend of desi & western. Now-a-days fashion designers are in a fix to make custom made products. Many national & international fashion houses established in Bangladesh to satisfy customer demand. Men & women want classy styles like renowned international brands. There is so many first-class grade replica shops also found for this demand. People following foreign models & hence trying to copy their outfits. It’s a positive cultural change in one sense. But we should not let go our own culture & try to modify them in a dignified way so that our culture doesn’t get harm. With growing textile sector, there are educational changes also. People are interested to higher education in Textile technology or Textile engineering, Industrial & production engineering, fashion designing etc. Along with public universities there are so many private universities which make resourceful graduates. After completing graduation, they also take so many professional trainings, PGD degrees etc. So RMG sector has a great impact on educational development of our country. Though small, but there is cultural change also. Some foreigners come to our country, marry here & get children. People also like to have international foods. In Bangladesh so many Srilankans, Pakistani, Indian, Vietnami, philipinos, Japanese, Americans lives because of their job sector in RMG. In some cases, their food habits also influencing us, their cultural beliefs influencing us & fusion occurs here also in a small extent. RMG sector is one of the important sectors which has so many contributions to the economic development of Bangladesh. In this article, some major economic contribution of RMG sector is described. It will be helpful to know the condition, impact, ways of development, future scopes of RMG sector in our country for economic development. Over the years we found that Major Economic Contributions of RMG Sector in Bangladesh economy. With increasing garments sector spinning, weaving, knitting, dyeing & chemical sectors adding value in economy. PTS (Primary Textile Sector) is the backbone of garments sector, which produces yarn & fabric. This sector has the opportunity of various diversification of yarn production. According to Bangladesh Textile Mills Association(BTMA), Now there are 425 yarn mills, 796 fabric mills & 240 dyeing-printing-finishing mills. Investment in PTS over six billion dollars. Textile sector contributes more than 13% in GDP. Almost 86% export earning comes from textile & textile related products. 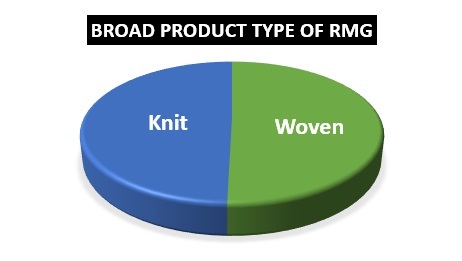 90% yarn demand for knit RMG & 35-40% for woven RMG are fulfilled by PTS. There are mainly four types of spinning mills we have. They are ring spinning, ring spinning with open end capacity, rotor/ open end, synthetic yarn mills. In overall scenario, 87 lakh spindles, 2.3 lakh rotor, production capacity 205 core kg (Approx. data). Bangladesh in well known for its well quality knit goods with lowest price. While spinning sector growth reaches 77% to 99% within 1986 to 2002, knitting sector catches the market with its various kinds, Dias or combined fabrics. Actual production capacity in weaving increased from 190 million meters in 1996 to 830 million meters in 2000. Dyeing finishing capacity also increased from 366 million meters to 680 million meters within this time. Weaving mills producing woven (561 mills), denim (21 mills) & home textiles (18 mills). Here looms-17000 shuttles less and 13000 shuttles, production capacity 215 core meters (Approx. data). There is power loom & hand loom sector also. In power loom sector share, lungi, gauche also produced. There are 1065 no. of units & capacity 40 core meter & around 43000 people earn their livelihood by this sector. In hand loom sector Jamdani & Banarosi types luxurious share are produced. Around 183512 small to large units exists, capacity 837 core meters, around 5.05 lacks hand looms and around 10.20 lacks people work in this sector where 50% women. Garments sector growth has a positive impact on widen the co-relative sectors. At starting we needed to import fabrics, trims, chemicals, accessories etc. from abroad. With vast growth of RMG sector, we have our own knitting sector, yarn sector, chemical sector, accessories sector and so on. According to Bangladesh Bank report on RMG, the rate of value addition stood at 74.86% in the fiscal year 2013-2014 & the highest was 75.67% in 2014-2015. Now the knitting sector added value more than wove sector. According to the RMG sector, people value addition rate of knitting sector is 90% while for woven it is 55%. Once upon a time, we were fully dependent on imported denim fabric, in current scenario 50% of the fabric locally produced. The average value addition from the Denim sector is around 70%. During an interview with The Daily Sun, Bangladesh Textile Mills Association (BTMA) director Mohammad Khorshed Alam told they have a capacity to meet around 98% of demand for fabrics & around 55% of woven fabrics for the export-oriented industry. BTMA director also added that by setting 28 denim textile mills it improved significant progress in denim fabric. Bangladesh Garments Accessories & Packaging Manufacturers and Exporters Association (BGAPMEA) president Abdul Kader Khan admit that local industry now meets up 95% of the requirements of exporters. The industry also adds 30% value addition to its products. 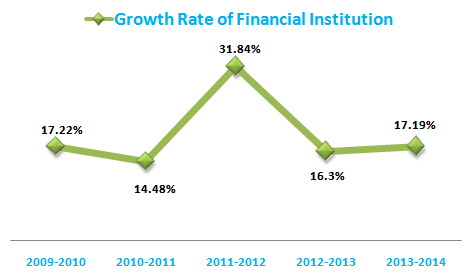 RMG growth has a positive impact on the growth of financial sector in Bangladesh. With the help of letter of credits(L/C) both garments & textile sectors flourishes. Banking sectors facilitates payments, deeds, finance & risk management services to the RMG traders while contributing to global trade integration. The success story of RMG began with the launched of the back to back L/C practice in late 1970’s. Desh Garments Ltd. Initiated this first. More than 10 million people are indirectly associated with this industry. 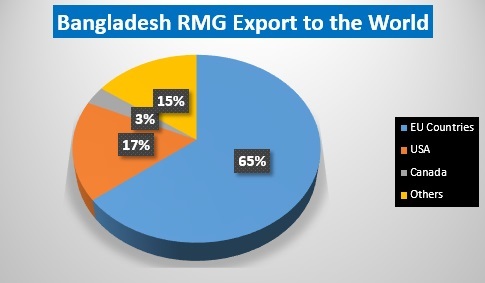 According to Bangladesh Bank data, import price of raw materials stood at 3716 M $ during the first half of fiscal year 2018, which is around 25% of total RMG export value. Thus, the gross value addition from this sector stood around 75%. The major importing countries of RMG products are the US, UK, Germany, France, Italy, Spain, Belgium, Denmark & Canada. In recent, the export financing business of the commercial banks is largely dependent on the textile and RMG sectors. A study conducted by the world bank found that about 98% organization looks for working capital from commercial bank and 57% of their financing of machineries and equipment’s. RMG sector also has an immense contribution to Insurance services. On average, every year the RMG sector premium paid to the insurance companies was about 6 million dollars. All firms insured their machines and plants and, 87% of importers of input and 15% of the RMG exporters insured their imports/exports. The health insurance policy reduced the absenteeism of the RMG sector. By analyzing a study, Syed Abdul Hamid, director of the Institute of Health Economics of Dhaka University, said that the insurance companies believe that workers tend to seek more healthcare adding that many of the workers want to take maximum benefits, worth about 15000 takas against their premium of 575 Taka. That study also found that owners of the factories wished to increase 50% of the premium contribution while beneficiaries showed willing to contribute up to 50%. In accordance with growing garments sector shipping & logistics sector become an important part of economy. Setting up large warehouse facilities, distribution channels, supply chain forum, shipping, logistics become business trends as RMG is export oriented. RMG sector earn more than 40% of the income of the port authority. For shipping charges there includes documentation fee, inbound manifest correction fee(CMA), Container lift on or port charge, Clear/cleaning charge & security deposit. The contribution of RMG sector for shipping is logistics is mainly for international shipping and logistics where different duty, commission, tax, insurance, freight charge are paid. Along with tremendous improvement of garments sector, transportation system of our country become more developed. Not only railroads, highway roads also developed & increased. Previously for export shipping system was only way. But nowadays roads & airways are equally used. From covered van to cargo services, it becomes a large portion of bridge, flyovers paying tolls as revenue. Every year a large portion of ship, airways, railroads earned vat & tax take great contribution in the economic development of our country. RMG sector also has a great impact on communication sector. It includes ICT, tele-communication system, web system, software & hardware etc. Most of the technology oriented apparel industries are tends to use ERP, Fast-react, GSD, payroll management software etc. Some are creating by their own specialists, some are buying as customer requirements. People are interested to use social sites of communicating with foreign buyers by using skype, emails, twitter, WhatsApp, LinkedIn etc. Now even people are searching their jobs on social sites or job portals. Now-a-days foreign buying house fixing video conference to set up order taking session. In these regards RMG has great impact on ICT sector revenue earning. With the growth of RMG sector, engineering & utilities services starting to expand its area. In most readymade garments industry electrical engineering, mechanical engineering, electro-mechanical engineering, automation engineering or industrial engineering department play a vital role. According to a study, this sector pays 14.2 million dollars to the engineering sector which includes professional service payments; machine, transport or vehicle service or repairing, electricity or generator setup & usage bill, water treatment & WASA bill, Machine automation or semi-automation, Industrial infrastructure setup etc. More than 1500 foreign apparel buyer’s representatives visit Bangladesh in a year. They like to stay three to five-star hotels in our country hence its increases hotel & tourism business in our country. Along with this, restaurant & hotel business become more popular. There are so many five-star hotels in Bangladesh & they have luxurious food facilities also. Foreign people staying in our country use departmental stores for their one-way window shopping. Now a days seafood, Chinese, Mexican, Italian, Japanese food courts become popular among with these people. Real estate industry is increasing day by day in our country. More than 4560 garments in our country & they need infrastructure facilities from real estate companies. People are tending to get things done in international standards so that foreigners are interested to visit their places. Some renowned apparel industry has large & magnificent infrastructure facilities along with international standard parking system, indoor playground, swimming pool, rest room, medical center, ATM booths, dormitories etc. Hence real estate business become more popular as there is large source of income from this sector. 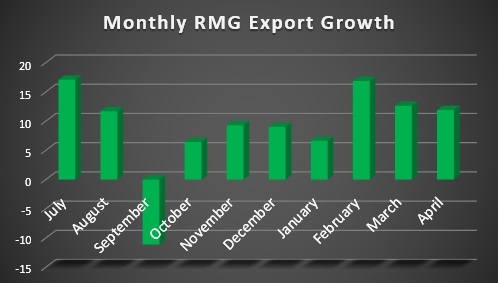 Some business sector growth increased with the RMG sector. Some of them are competing with RMG, for example, the electronic sector; some are anyway linked with RMG sector, for example, accessories or footwear sector. We are tending to go along western trends nowadays. So, some local companies using a mashup of western & our culture & making outfits, footwear, bags, ornaments & so on. For example, Arong, Vasabi, Yellow, Nabila, Fossil, Cats-eye, Desire, Vittate, Estacy, Richman, Westecs, le-Reve, Artisti etc. These kinds of fashion house are tending to make fusion products like mixing western culture & our culture basically Sari, Salwar kameez, jeans, tops, shirts, t-shirts, polo shirts, Panjabi, formal suits, wrist watches, Bangs, shoes etc. Fashion industry becomes one of the most popular business sector in Bangladesh. In accordance with RMG revolution, this sector also developed. People from our country are joining international modeling, fashion shows, ramp, beauty contest etc. There are so many private television channels. Some of our actors started work abroad also & achieving fame. Most of these parts credit goes to RMG sector. Along with these, Cinematography, photography & its relevant product business like camera, lighting setup etc. become more popular. So, in a sense, directly or indirectly RMG sector has great positive impact on the economic development of our country. Bangladesh is now one of the developing countries in the world. Ready Made Garments (RMG) has a huge contribution to the economic growth of this country. The current condition of RMG – Ready Made Garments Export of Bangladesh seems good because there is a positive growth of export earnings. According to Export Promotion Bureau of Bangladesh (EPB), for the year 2017 to 2018 (July 2017 to April), Bangladesh Apparel Export is growing at the rate of 9% which seems a significant amount. 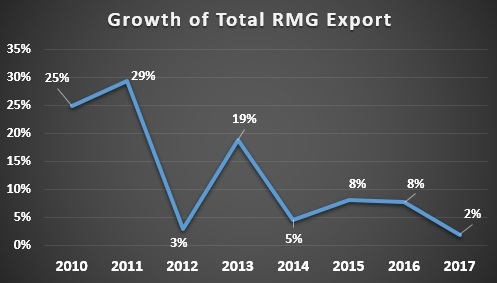 Here you can see that the growth rate of RMG export is always fluctuating, the reason behind this is a change in market demand, increase in the cost of making, political condition, market competitiveness, and the exchange rate of USD to BDT. Ready Made Garments industry is growing at the rate of nine percent compared with the previous year. But in 2016-17 this growth rate was only 2%. So there is a significant positive change in the export. We mainly divide our apparel product into two broad categories. One is knit and other is woven. Although the growth of Ready Made Garments increased in every month there was an exception for the month of September 2017. It is not clear why suddenly growth rate reached to a negative figure. 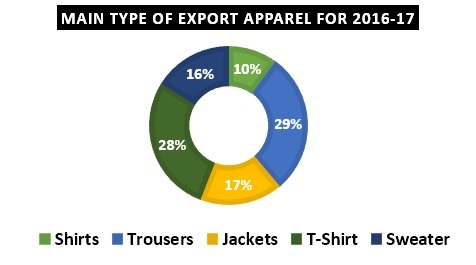 Bangladesh is mainly exporting Shirts, T-shirt, Trousers, Jackets Sweater among these Trousers and T-Shirt are exporting a huge amount, which is contributing at the rate of 29% and 28%. So these two products added significant value to the export earnings of Bangladesh. Most of our RMG is Exported to the European Union, where we export about 65% of our total export of apparel. Our second biggest client is the USA and the third one in Canada. Here look into this list that for the last 10 month EU countries is contributing 14734.69 million dollars. 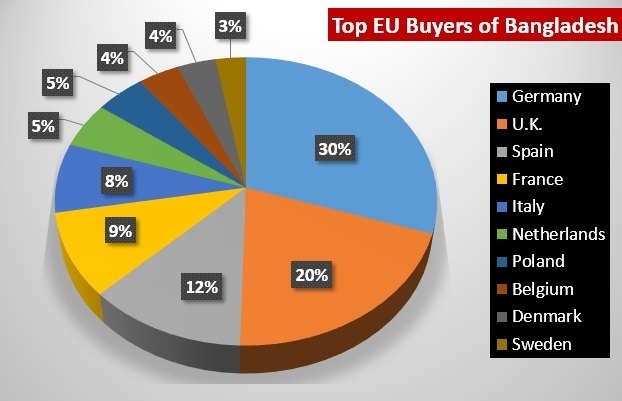 So there is no question of EU is the largest buyers of garments in our country. 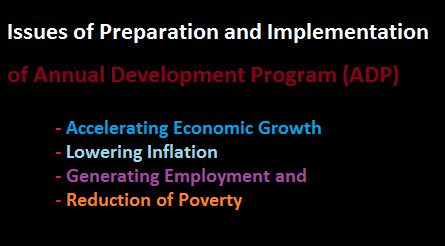 As per the poverty reduction strategy of the government of Bangladesh, the main issues of preparation and implementation of ADP (Annual Development Program) are accelerating economic growth, lowering inflation, generating employment and reduction of poverty. Do you agree with this statement? Justify your opinion. Yes, I agree with this statement, because Bangladesh is a developing country where most of the people living below the poverty line. Government is planning to establish Bangladesh as a middle-income country but the problem is poverty which must be resolved first to get the status of middle income. Another problem is imbalance income, here in Bangladesh 90% money is on the hand of 10% people and rest of the 10% money holding by 90% people, this ratio should be adjusted through the economic distribution of income and wealth to ensure balance. To ensure accelerating economic growth, creating employment and reduction of poverty line government took many strategic decisions like Annual Development Program. Every year a huge amount of money is allocating for the purpose of the annual development program and if requires then government revise the ADP year to year. ADP is under the development budget approved by the parliament; basically, the planning commission formulates the ADP of the Government of Bangladesh for the period of more or less than five years to meet several goals and objectives. For financing of ADP, both local sources (government or other financial institutions) and foreign (foreign aid, loan) are used. Over the year allocation from the budget for ADP is increasing by a considerable amount, in 1972-73 ADP was 501 crore taka, 1979-80 it was 2123 crore taka, 1987-88 it was 5046 crore taka, 1995-1996 it was 12100 crore taka and for 2015-16 it is now 97000 crore taka. Look at these above figures of ADP allocation over the year; you see huge amount of money is used for the purpose of annual development and for this reason our economy is now expanding, more local and foreign investment creating employment for the people of Bangladesh which are working as a driving force for the increase of income, consequently it is reducing the poverty of our country. Another great challenge for the government of Bangladesh is to keep the inflation rate at a minimum level. Although we have seen that the inflation level was increased up to 9.09 percent in May 2014 and 5.86 percent is the lowest ever in December 2014. The rate of inflation in our country is normally on an average 6 to 7 percent. So in this perspective, we can say that the government of Bangladesh is quite successfully managing our inflation level which is one of the prerequisite to ensure a proper economic growth. Now come to the point how economic growth is done through ADP over the years, economic growth is the increase in the value of all goods and services produced in a country for a period of time. GDP- Gross Domestic Product is the determinant by which we can say what going on with the economy; it is growing positively or negatively. Here for Bangladesh, you can see that although there was an economic recession in many countries we had maintained our positive economic growth which is one of the main indicators that we are doing well. Under the annual development program, several sectors are getting priorities like infrastructural development, ensuring quality education for the people, adequate health service, developing information technology to ensure digital Bangladesh, agricultural development and supporting women to become an entrepreneur. An economic growth can be possible through properly using a natural resource, capital, human resource and information technology. In addition to these, there should also capacity to meet demand and efficiency in the operation of the business. Through these annual development programs our economy is moving positively, more new local and international companies are showing their interest to invest here and it is government responsibilities to ensure a positive environment for investment. More investment will create more employment opportunities, as people are getting employed our employment rate will be high. Because of employment, we will have more earnings to spend, hope this will help us to reduce our poverty. The important thing is to keep the inflation rate at a lower level, although it is a very much challenging job for the government to lower the inflation rate it has to. The government should implement monetary policy to control the money supply and fiscal policy to minimize or maximize the government expenditures and revenues. Also, it is required to monitor and control the exchange rate of our country as our country’s economy is highly dependent on the remittance and the import and export. Example: As a vision of digital Bangladesh government spending lots of money from the ADB for Information Technological development. Now we are seeing that there is a positive impact of this IT development. Many people are getting employed, they are earning through outsourcing and working here in Bangladesh for the local firm. It is helping to generate the employment and earnings of the people which moving our economy positively. If everything happens in a right way then we hope that the annual development program of the government will create a positive impact to ensure Bangladesh as a middle-income country. Why are the economic analysis and in-depth understanding of economic factors is important for effective decision making in capital market? Investors always try to formulate best possible portfolio by investing in the capital market for the purpose of getting capital gain and dividend (cash or stock). It is not an easy task to choose best investment alternatives because the proper analysis is required. Only a specialized person would be able to analyze the market and identify the potentials. Many people think that only financial analysis is enough to make an investment but in a real sense, not only financial analysis but also economic analysis is required. In case of financial analysis, we only consider the company and industrial outcome through fundamental and technical analysis. But whenever we go for analysis by considering economics we have to analyze the macroeconomic factors that may have an impact on the capital market. An economist or any other professionals those have knowledge of economics can do this analysis on behalf of investors. But investors also have to have basic ideas of how economic factors can influence the price of the investment securities. In an inflationary economy, investors have less money to invest because investors have to spend more money on their consumption. As because there is a less demand for the stock in the capital market, the price should be lower; we know that lower the demand lower the price. In the other sense in case of a company, for inflation, the production cost of the company is higher than the previous. So company’s income will be lower that stimulate the price of the stock. We know that the stock which provides more dividends to the stockholders, that stock should price higher than the other company which provides lower dividends. If the market interest rate increases then an investor will prefer fixed income securities rather lower earning risky securities. Suppose government bond providing 10% of interest then this bond will get more preference compared with risky investment. On the other hand, if the interest rate is lower in the market then an investor will borrow the money at lower interest and invest in the capital market. Because of economic recession, there may have a positive impact on the capital market. Normally at the beginning of recession investor loose but there is always an expectation that in near future there will be positive movement in the stock price in the market, so investor prefers to invest when there is a recession. This will happened only if there is the strong form of efficiency exists in the market. On the other hand, if there is an economic boom situation exists then there may have a possibility of declining market price movement. With the increase of a number of employees in a country per capita, income will also increase. For this people will have extra money after consumption. If people capital market is performing well then an investor will be interested to invest their surplus amount of money. So higher the employment higher the earning and it does increase the investment in the capital market. Political condition is one of the main factors which have a huge impact on the overall economy and the capital market. People believe that a positive economic condition is required to maintain a stable capital market. Several financial decisions taken by the government over time to time, so it is also important to know how much preference a capital market gets from the government. In a capital market investors basically, invest in long-term security so the investor must consider all probable aspects and economic factors before making an investment. A choice of investment in capital market can lead to a huge capital loss, so proper analysis has to done by the professional and select best opportunities. Finally, one thing is that an investor should consider economic factors which have an impact on the capital market and proper financial and economic analysis must be done before investing in the capital market. The economy of Bangladesh is a mixed economy where both government and private sector control the economy by planning and mixture of market. In a broader sense we can divide our economy into several industries. Financial industry is one of the leading industries which have great potentiality. Every year this industry is contributing large amount of value to the GDP (Gross Domestic Product) of our country (Bangladesh). With the expansion of the economy we require to ensure security of money and effective use of the money. Considering these needs financial institutions are formed. In our country both bank and non bank financial institutions are available. Bank provides pure banking services and other financial services provided by non-bank financial institutions. Non bank financial institution can be financial intermediaries, insurance companies and leasing companies. Central Bank of Bangladesh (Bangladesh Bank) is the sole institution responsible for controlling the financial institution and financial industry. Under the control of Bangladesh bank there are 65 banking institution (private, public/ state owned, specialized, and foreign) and 32 non bank financial institutions (mainly private) provides leasing and investment facilities and 62 insurance companies (private, public, foreign) providing life insurance and non life insurance policies. Every year millions of taka is contributed by these financial institutions and is expanding exponentially. For this reason this industry considered as a base industry for our country. If we see the trends of contributions made by this industry then it will be clear that how much value added. From the last 5 years of data we can forecast that in the upcoming year our GDP will grow much more than these years. People can say that only 3% plus contribution is not much for an economy. But I am strongly saying that this percentage looks small but the amount of contribution is huge. In 2009-10 the contribution was 3.08% but with the passes of time this percentage is increasing. Last year that is 2013-2014 the contribution was 3.85%. Hope in the next year this will reach to 4%. Although this industry is doing well but with the change in the economic condition the growth also changes. 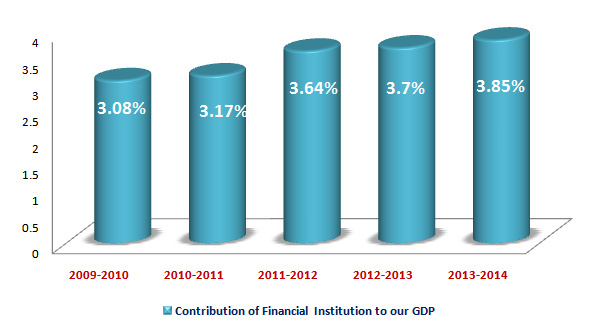 There is huge change in 2011-2012 in the financial sector according to the contribution to our GDP. Because of more foreign direct investment there is inflow of funds in the economy which circulate through financial institutions. Investment in long term asset and infrastructural development was done by the government and private sector. The positive sign is average growth is 15% plus. Near future hope this will reach at 20% plus with the expansion of total economy. From the above identification we can assume that one day our economy will be much more efficient. Because we have financial institutions with modern technology which providing services as per required by the people at any time anywhere. Bangladesh is a developing country with the population of 157,949,908 where economic is expanding day by day. After the independence, our economy is reformed to manage it in our own way. Now ready-made garment (RMG) sector is performing very well compared with another sector. With the expansion of information technology, many new industries have emerged. The contribution of each and every industry is considerable although 10 to 15 years back the contribution of information technology & telecommunication sector to our economy was minor. But now these two sectors generating a large amount of revenue for their own and make a good contribution to our economy. With the increase of educational status, the standard of living is improving. If these continue our economy will be a model for other developing countries. Although the current economic condition of Bangladesh is good enough government needs to monitor every economic activity closely. The performance of economy can be measured with the help of GDP (gross domestic product) i.e. the value of all products and services produced within the boundary of our country. Our GDP for the year 2013-2014 was 6.12% where the growth is 12.68% from the previous year. GNI is 4.76% which is grown by 11.24% compared with previous year. The contribution of agriculture to our economy is most. Once upon a time, we cannot think about our economy without agriculture because 85% people of our country were involved with agriculture. But now the situation has changed, with agriculture now ready-made garments (RMG), bank and non-bank financial institutions, outsourcing, exporting manpower adding extra value to our economy. Our economy can be divided into 15 different industries in a broader sense. If you check the industrial contribution to our GDP for 2014 we will see that manufacturing industry is contribution larger portion to our GDP of 17% whereas agricultural and wholesale-retail trade contributing each 13% of total 26%. 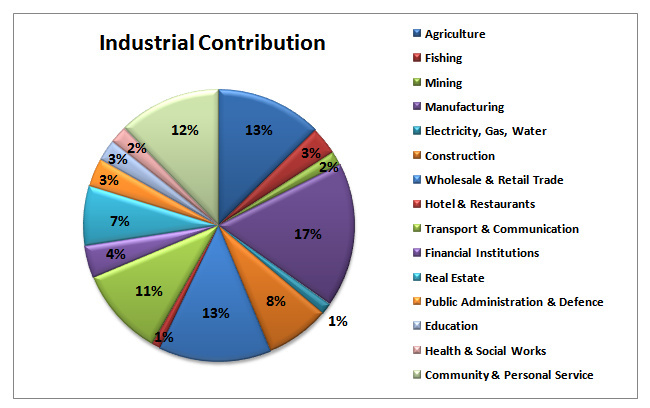 Communication and service sector contribution total of 23%. Where community and service sector contributing 12% of our total GDP and communication (transportation, telecommunication) sector adding 11% value to the GDP of Bangladesh for 2014. Other ten industries also contributing a considerable amount each and every year. For ensuring economic growth government should take following things seriously otherwise our economy down soon. In our capital market, there are two stock exchanges. One is DSE-Dhaka Stock Exchange and other is Chittagong Stock Exchange-CSE. Dhaka stock exchange has total 549 listed companies and Chittagong stock has total 250 listed companies. Although stock market doing well over the years a few years back stock market (capital market of Bangladesh) crashed. Stock market accelerating unpredictably, at that time many investors acquire much capital gain. The capital market rises 62% in 2009 and 83% in 2010 but then went down 10% in January 2011, and a further 30% fall in Feb 2011. These falls continue for this reason many investors lost them all investment. The government tried to make a correction and still trying but it will take time to stabilize. In 2015 if we check the index of stock market then we can see that market still not doing well. So investor must be cautious before making any investment decision in the stock market. People working outside Bangladesh are contributing to our economy indirectly by sending remittance each month. This large amount of remittance is helping us to improve our economy. Foreign currency reserve also increasing by the remittances and export of ready-made garments. Here is the scenario of remittances for the year 2014 and 2015. 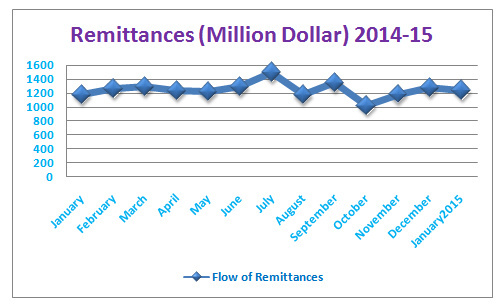 Remittances flow looks like stable but in this year remittances are decreased compared with previous year. There is a considerable change in the reserve of foreign currencies. If we look at the reserves for each year we will see there is a positive movement each year. 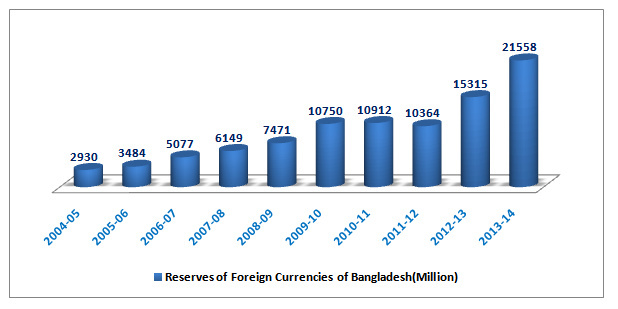 In 2004-2005 our foreign currency reserve was only 2930 million dollars whereas in 2013-2014 our reserve is 21558 million. Within these 10 years, the rate of increase of reserve is 635% which is a great achievement for our economy. If we can utilize this large amount of foreign currency reserves by importing capital goods and invest in productive sources then our economy will be much more efficient. This ultimately helps our economy to grow faster than previous. Every year we import a large number of goods from different countries around the world but larger portion comes from China and India. Last year we imported from China 20.70%, 16.60% from India, 6.30% from Singapore, 5.60% from Malaysia and 3.50% from Japan. The electronic product mainly imported from China. Reserved foreign currencies are used to import. RMG sector is the highest growing sector which contributes a huge amount of money each year. It is government’s responsibility to ensure a positive environment so that this sector can grow fluently. One of the main reasons for the success of RMG sector is the cheapest labor available in our country, which ensures low cost of production. We have a large number of young people those have the ability to world. If we can ensure proper use of the human resource then we will be a developed country soon. Availability of natural resources and low cost of factors of production foreign buyers are interested to invest here. If there is a large amount of foreign direct investment then it will create employment of many peoples. Outsourcing and tourism are two potential industry which will bring millions dollar’s foreign currency, which will increase our reserve of foreign currencies. We required foreign currencies to import capital goods. Political instability is one of the main problems which we can see in recent years. At the end of the 2013 political condition started to deteriorate now 2015 looks like our economy is stuck. Export is decreasing for the reason of delay in delivery of goods. Exporters cannot send the goods timely because of a lockout of internal route transportation. Burning and breaking of vehicles etc. The decision taken by the economic policymaker is most of the cases wrong and in some cases are not an effective one. There is an absence of proper monitoring system for the potential sector, so government failed to deliver the subsidiary and ensure a positive environment. Ensuring political stability to attract foreign buyers and investors. Forming proper monitoring and controlling cell. Taking effective economic decisions to ensure proper use of resources both natural and technical. Keeping inflation rate at a normal level so that buying the power of money not reduce significantly. If we can ensure above-mentioned things then our economy will be perfect for investment. And one day this economy will be stable and more growth potentials.